90% of all the material in the Universe is of material we cannot see. While this seems to be an almost embarrassing situation for Astronomers, super-computer simulations, improved methods of observation and particle physics are providing more plausible models of dark matter. While the results so far have only ruled out previous contenders – like Modified Newtonian Dynamics (MOND) and Massive Compact Objects (MACHO’s) – there are still unanswered questions. Hot, Warm, and Cold Dark Matter – composed of small, weakly interactive particles – are the more recent models with the Cold Dark Matter (CDM) model the current reigning champ. In addition, observational data, new computer simulations, and the constraint of the age of the Universe have eliminated the hot and warm dark matter models. Although the CDM model is the current favorite, it is not without its share of problems. Self-Interacting dark matter and Tachyonic dark matter are geared towards supporting the difficulties of the CDM theory, but are still theoretical. The hope of repeated direct detection of the CDM particles will soon be a reality, so we may one day finally have direct, observational evidence of dark matter. It is really hard to imagine that any topic in science can be the source of targeted and contemptuous debates. With regards to dark matter, the camps have clearly demarcated battle lines, and the scouts are on the lookout. Just how heated can these debates be? One of the many ideas of dark matter is the use of modified Newtonian dynamics, or MOND. It is suggested by MOND that dark matter has been miscalculated based on the acceleration curves of galaxies (Kaplinghat and Turner, 2002). In addition, it is the believed that the CDM computer simulations confirm the MOND ideas. While MOND is the primary source of the dark matter theory, it was not the intention of the author that the particles of the CDM theory be eliminated (Kaplinghat and Turner, 2002). In response to this, a paper was submitted a few months after directly attacking the Kaplinghat and Turner 2002 paper (KT). It is argued that the KT paper only addresses the dark matter constituents residing in the halo of single galaxies only, and states that their mechanics in describing the galactic acceleration curves are incorrect (Milgrom, 2002). This paper uses words like “crude” and “phenomenologically wrong” and basically misreads the KT paper in assuming the authors completely disregarded the constituents of dark matter altogether. While our observations do not agree with MOND, it is clear that such debates exist and the ideas and theories of dark matter have the ability to divide the world of Astronomy and Astrophysics. Our understanding of Newtonian and Keplerian mechanics is quite good. After all, the planet Neptune was predicted to be in its exact spot when finally viewed with a telescope using this same math. We can map the orbits of planets, and map the rotation curves of galaxies; however, the galactic rotation curves turned out to be problematic. 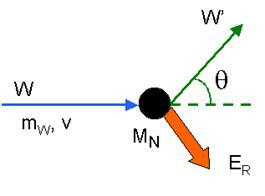 In Keplerian mechanics, as an orbiting object is father from its point of rotation, the speed of rotation is decreased (figure 1). 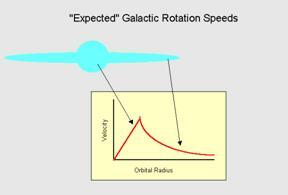 Figure 1: Using Keplerian mathematics, this is the expected rotation curve of a galaxy. It turns out that every observed galaxy does not have this expected curve. Instead of the standard curve, our actual measurements of galactic rotation is a bit different, indicating that something massive must exist beyond the visible edge of a galaxy (figure 2). Figure 2: An actual rotation curve of our own galaxy – The Milky Way. This type of curve has been seen in every galaxy we have studied, indicating the same phenomenon is present in all galaxies. The phenomenon is dark matter. In addition to these rotation curves, another indicator that dark matter exists is the presence of lensing by individual galaxies and galaxy clusters. Einstein’s theory of Relativity tells us that mass act upon everything, including light. The easiest explanation is that all things in space move in straight line, but their paths are altered by distortions in space-time. An example: the orbit of Mercury about the Sun. Imagine space-time as a rubber sheet, and our Sun is placed in the center. Since the Sun is much more massive than anything else in our Solar System, a very large depression is made. The path of Mercury is in reality straight, but because it is close to the Sun, and stuck within the depression made by the Sun, it is traveling in a straight line within this curve of space-time (figure 3). Figure 3: The Sun creates a depression in Space-Time, and the orbiting planet is caught in the curve. Figures 4, 5, 6, 7 and 8 show just how mass can affect the path of light. The gravity lens is strongest proof we have that dark matter does exist. 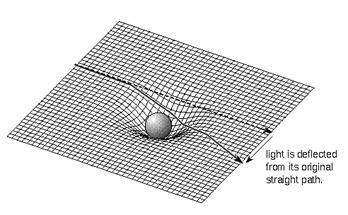 Figure 4: As light travels near a depression of space-time, the path of light is altered. Figure 5: As seen from Earth, the position of a star near the Sun appears to shift in position. Figure 6: A massive object, like a galaxy, can act like a lens. 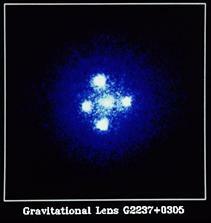 The result is the diffraction of light around the massive object that results in what is called the Einstein cross. Figure 7: A photographic example of an Einstein cross. This image corresponds to figure 7. The object in the center is a galaxy that lies between us and the quasar. The quasar is beyond the galaxy, but the mass of the galaxy acts as a lens. The four objects that make up the cross are actually the single quasar that lies beyond. Figure 8: The greatest example of a gravity lens. 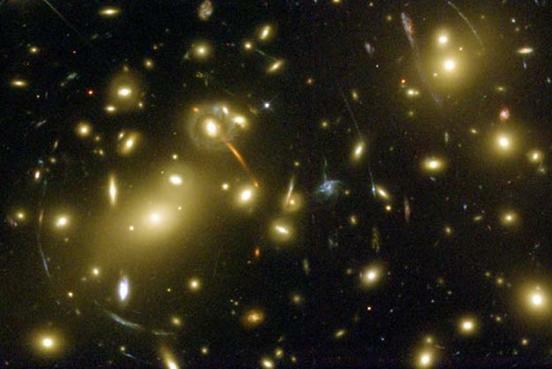 Galaxy cluster Abell 2218 has enough mass that multiple distant objects appear as arcs in the image. The visible mass alone cannot provide the required mass to create such distortions in space-time. The only solution is the introduction of dark matter. The Tully-Fisher correlation (the correlation of a galaxy’s luminosity versus its rotational velocity) proves the existence of dark matter (Silk, 1999). With the affects of the gravity lens on the scale of galaxy clusters indicate that dark matter exists around individual galaxies, and in between galaxies that are members of a cluster or a group. It is widely accepted that our Universe came to be by way of the Big Bang. Why the Big Bang occurred is an answer that is pretty tough to solve, but we know there was a big bang by studying the results of the Wilkinson Microwave Anisotropy Probe (WMAP). The entire Universe was the target of this probe, mapping the background microwave radiation – the leftovers from the Big Bang. Not only does this background radiation demonstrate that such a big bang occurred, the speed of the galaxies increase with increasing distance from us (also called the Hubble Law). With the age of the Universe at 13.7 billion years, we now have one variable solved when we run computer simulations of our Universe. It is also generally accepted by Astronomers that the hydrogen atoms did not start to form until 300,000 years after the Big Bang – the temperature of the Universe was too hot prior to this (again, as indicated by the background radiation). We are sure dark matter exists in the Universe today, so it follows that dark matter must have existed during the early formation of the Universe. One of the particles believed to be holdovers from the Big Bang are neutrinos. Because we know this particle exists, and is weakly interactive with matter, the neutrino is the ingredient of the Hot Dark Matter model – which we now know to be incorrect. 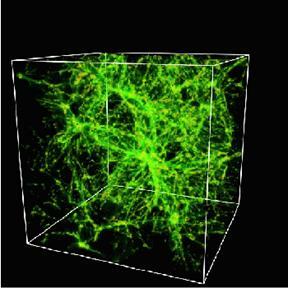 It is very difficult to view the Universe in its infant stages of matter formation, so we must rely on computer simulations. Computer programs are written to create a single particle conforming to a series of parameters – like mass, size, speed of movement, and so on. Multiply this by about a million (or so), and then write another program on how each particle responds to each other, again multiplied by about a million (or so). The end result is a program that cannot possibly be run on a stand-alone PC. Dozens of computers are tied together and controlled by a cluster manager server that uses all of the processors to run this program. This is called a super-computer. While it is beyond the scope of this project to demonstrate the intricacies of using a super-computer to create simulations of dark matter, we will only focus on the results. What we have learned is that dark matter shaped our Universe by creating strings of material that attracted matter gravitationally to create structures like star clusters, galaxies, and galaxy clusters. An example of a small section of a simulated Universe is shown in figure 9. Figure 9: The shows an end result of a computer simulated Universe. All of the strings indicate the distribution of all known galaxies and galaxy clusters. This type of model is often called an N-Body Hydrodynamic model (Silk, 1999). One of the previous favorites of dark matter is the massive compact objects, or MACHO’s. These baryonic objects are: black holes, neutron stars, white dwarfs, red dwarfs, and brown dwarfs. The stellar remnants – black holes, neutron stars and white dwarfs – are very small and contain significant amounts of mass in a fairly compact size. Red and brown dwarfs are not as massive. Brown dwarfs are stars that have not initiated hydrogen fusion. All of these objects would occupy the galactic halo – an imaginary bubble that surrounds an entire galaxy that contains very old stars, globular clusters and dark matter. An immediate problem regarding the theory of MACHO’s is the lack of explanation to the constituents of dark matter that lies in between galaxies within clusters. In addition, observations by the Hubble Space telescope have ruled out any significant contributions of dark matter by red and brown dwarfs (Flynn, Gould and Bahcall, 1996). The Hubble Space Telescope data showed that white dwarfs could provide almost 2% of the mass of the galactic halo, but further simulations and re-evaluations of orbital kinematics place the white dwarf contributions to only 1% (Gibson and Flynn, 2001). Further simulations of the white dwarf contribution show that they do not provide mass to the halo, but are a part of the galactic thick disk (Reid, Sahu and Hawley, 2001). What is most interesting about the thick disk is its role in helping to confirm the existence of Cold Dark Matter. Using computer simulations, it has been shown that the thick disk of our galaxy was formed with the assistance of CDM, and that the thick disk formed first (Brook, Kawata, Gibson, and Freeman, 2004). This fits the paradigm of the CDM simulations that violent merging and abrupt star formation helped to form the thick disk. Hot Dark Matter – what happened? The HDM model was favored initially because it contains particles we know to exist – neutrinos. The problem with the HDM model is twofold: firstly, when the theory was put together, neutrinos were though to have either zero mass, or very little. The recent observations with the Sudbury Neutrino Observatory indicates that neutrinos oscillate – indicating mass, thereby solving the infamous Solar Neutrino Problem. Secondly, the model of the HDM Universe was based on relativistic, fast traveling, zero mass particles (neutrinos) that resulted in creating only large scale structures – like galaxy clusters – but failed to develop the smaller individual galaxies. Even factoring in neutrino mass, the HDM model was unsuccessful in creating individual galaxies. The answer to the HDM model: Cold Dark Matter and Warm Dark Matter. Figures 10 and 11 shows a side by side comparison of the CDM and HDM models; notice the HDM image with large scale structures only as compared with the CDM model which shows a more pronounced structure of smaller density regions. The CDM model is more consistent with what we observe. These four reasons are the results of computer simulations. Figure 10: The end result of a CDM simulation – more detail. Figure 11: The end result of a HDM simulation – large structures only. While these seven points of correction are compelling, Metcalf (2002) points out that there is no evidence one way or another that empty halo objects within the voids of space do not exists – they very well could exist but their nature prevents direct observation. So what happened to the WDM model? The results from the WMAP probe placed some serious constraints on this model. The re-ionization period of the Universe is when hydrogen was cool enough to interact with each other. Based on the computer models with the new WMAP data included, the WDM model must rapidly increase its ionization factor (which it cannot by design) to match the new constraint (Yoshida et al., 2003). Figure 12: A CDM sample simulation (on a better computer that figure 11), showing the similar structure of our observed Universe. Figure 13: A WDM sample simulation showing an almost identical overall structure, but arrears to be more smooth as well. 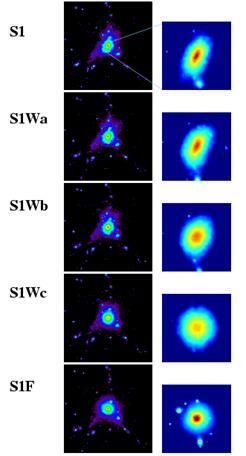 Figures 12 and 13 show a single frame example of CDM versus WDM. The WDM simulation looks visibly smooth but we now know the WDM model does not work. Neutrinos were relativistic since the formation of the galaxies making them hot (Gondolo, 2004). Since the neutrino is the only weak interactive particle that we know to exist, and because they are considered hot, they are a poor choice for the ingredient of dark matter. 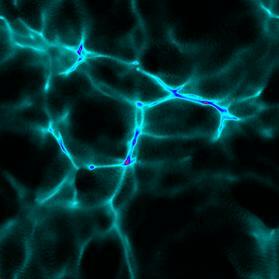 The CDM model relies on undiscovered weakly interactive particles that make up dark matter. The problem is the model with the parameters fitting these particles demonstrates a fairly successful representation of our Universe; but what are these particles? The primary ingredient of CDM is non-baryonic WIMP’s (Weakly Interacting Massive Particles). A baryon is simply the smallest parts of matter as we know them: protons, neutrons, and electrons. Leptons are electrons and neutrinos, and are also called non-baryonic. Since neutrinos are ruled out as a constituent of CDM, other non-baryonic particles are candidates. Since we do not know if they really exist, we cannot call them leptons. With names like neutralinos, axions, WIMPZILLA’s as candidates (Gondolo, 2004), it is hard to imagine that these really do exist. Because the CDM model has endured computer simulation models and observational data – with only “minor” issues – the task is to attempt to determine why this model has trouble with galactic halos being either empty or too compact – and of course attempt to detect these unusually named particles. One method that has been suggested is to redo the entire simulation process. In a paper by Ma and Bertschinger (2004), it is suggested that the N-body simulations is flawed and will always lead to the “cuspy halo” and “dwarf satellite problem.” By creating a model based on cosmological theory and perturbation theory, the “phase-space distribution of dark matter particles in galaxy halos” will be formed without the two major problems resulting from the standard N-body simulations. In a paper by Metcalf (2002), long term study of two radio jets from distant QSO’s (Quasi-Stellar Objects) using the VLBI array and examination of the radio jets show the images of the jets are slightly bent. This is significant since the bending of the radio jets are not consistent, indicating clumps of dark matter within the halos of the early galaxies. This is also significant because this rules out the WDM model since this model attempts to smooth halo formation. While this may seem as just another confirmation of the CDM model, this is perhaps one of the few direct observations of dark matter because its affects can be measured directly over time. A remarkable experiment called DAMA (DArk MAtter) has been using three styles of detectors in an attempt to discover WIMP’s (in operation from the years 1997 to 2003). This experiment looks exactly like the experiments to detect and study neutrinos (figure 15), but the DAMA is looking for a specific reaction, seen in figure 14. Specifically, the energy as the result of an interaction with a particular element will be at a particular angle. 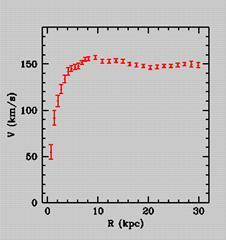 Figure 14: According to the DAMA website, WIMP’s are traveling within our galaxy halo at 232 km/s. By measuring the affect of a WIMP (W) on some other element (Mn), we can rule out other particles (like neutrinos) that would also interact with the same particle. The DAMA experiment was a three phase process, with two R&D setups and one actual experiment based on the results of the R&D. The idea behind the experiment is simple: As the galaxy rotates (at 232 km/s) we are sweeping through the residual CDM material in the halo. By studying the reactions of these particles using the illustration in figure 14, it is possible to detect the WIMP constituents of CDM. Only a brief explanation and result will be mentioned by each of these phases as this begins to delve deeply into particle physics. Using CaF4 to look for a 2β decay (to eliminate known leptons) an attempt was made to determine signs of WIMP detection. The results were believed to be successful, so phase two was designed an implemented. Using 129Xe, it was believed the sensitivity of this R&D phase identified three WIMP particles believed to be photinos, higgsinos, and Majorana Neutrinos. The success of this detection was lead to phase three – the actual experiment. LIBRA – Large sodium Iodine Bulk for Rare processes. NaI detectors built after the two R&D phases ran for 4 years. The results of the experiment determined there are particles that carry the qualifications to be WIMP’s, but the results (available from the DAMA website) are confusing at best. 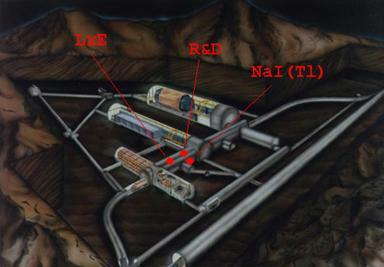 Figure 15: Reminiscent of the neutrino detectors, the DAMA experiment lies deep underground to avoid interactions with any other particle other than WIMP’s (this includes neutrinos, which are ruled out by a specific reaction). The DAMA project is indeed a bold experiment, and certainly determined the existence of some particles that match the requirements of WIMP’s, but to call them by specific names is a bold assertion, especially without independent collaboration. However, the results of the DAMA are already being interpreted as solving the dark matter problems. The mirror symmetry theory of particle physics states that every particle has a mirror particle (not to be confused with matter and anti-matter). It is asserted that mirror matter has been interpreted by the DAMA experiment to be the sole constituent of CDM, solving for the large quantities required to fit the model (Foot, 2004). Regardless, the results from this experiment will need to be interpreted carefully and be confirmed by other sources (as dictated by the scientific method). One of the issues acknowledged by attempting to detect WIMP’s is the ability to also detect neutrinos. Regardless of what method used to detect the particles, background suppression must also be designed into the detector. The CREST-II project using CaWO4 cryogenic detector, in its initial R&D and test run stage, promises to eliminate false detection by implementing background suppression. This project is sure to provide the much needed particle detection confirmation required to interpret the data more effectively. The current status of this project is still ongoing, but as of right now they have the ability to constrain background noise introduced by weakly interactive particles that are not the target WIMP’s. As mentioned several times, the CDM model best fits our observable Universe except dwarf galaxy evolution and halo density. Instead of abandoning the CDM theory altogether, it is better to try and solve these issues within the model. One answer is self-interacting dark matter. This is not a new particle or a re-write of the theory; instead, the attempt is made to determine if CDM particles interact with one another during galactic halo evolution. This self-interacting (sometimes called collisional) dark matter has been modeled to show that interaction with each other during galactic halo formation has resolved some of the issues initially generated by CDM simulations (Yoshida et al., 2000). Figure 16 shows an example of Monte Carlo simulations on a local level (called high resolution simulations by the Yoshida et al, 2000 paper). What these results show is the result of a gradually increasing interaction between particles. The greater the interaction, the more spherical the model becomes. The results of the Yoshida et al (2000) show that the S1Wb result best fits observed and simulated densities of cores of these smaller simulated structures. Dark Energy – which has not been covered in this paper – begins to trail into the pure theoretical with mathematics to match. However, one example of the Dark Matter/ Dark Energy theory of interest is the role of the tachyon. You may recall the mention of tachyons in various Star Trek: The Next Generation episodes and I was actually a bit surprised that science is lending them some credence. The importance of mentioning these particles is their purpose to support the CDM model. While the mathematics are far too advanced for the scope of this paper, it is generally thought that the tachyon fields exists as sort of a super-fluid that provides the energy comprising the Dark Energy theory, while at the same time providing the support for the CDM particles (Herrera, Pavon and Zimdahl, 2004). If that seems a bit confusing (and I’m sure it does), the importance of this field is to provide support for the structure of the CDM filaments as the Universe expands. The Cold Dark Matter model is the current accepted theory of dark matter. While the two main issues are problems with galactic halo formation and the dwarf galaxy problem, this apparently can be addressed by looking carefully at how we model the simulations in a supercomputer (instead of abandoning the model itself). At the same time observational evidence of WIMP particle detection, constraints of the age of the Universe by the WMAP, and examination of radio jets of large galaxy support the CDM theory while ruling out the WDM and HDM models. The purpose of Tachyonic and Self-Interacting Dark Matter is also used to help solve the issues with the CDM model while also addresses the Dark Energy problem as well (not covered here). Dark matter most certainly exists and while we currently have no idea what dark matter is, we are rapidly closing in on finally detecting dark matter particles directly. While there are sharply divided camps in the theory of dark matter, more and more theorists are acknowledging the CDM model and are focusing their energy into helping smooth out the difficulties. The attempts made by the DAMA experiment and the CaWO4 cryogenic detectors are important to mention, but until their results are independently confirmed by other detectors we should hold off on opening the Champagne bottles. One thing is certain: we are closer to identifying the constituents of CDM and the mystery of dark matter is certain to be solved in the very near future. Angloher, G, et al. “Limits on WIMP Dark Matter using Scintillating CaWO4 Cryogenic Detectors with Active Background Suppression.” ApJ, in press, astro-ph/0408006v2. Bode, Paul, Jeremiah Ostriker and Neil Turok. “Halo Formation in Warm Dark Matter Models.” The Astrophysical Journal, 556:93-107, 20 July 20, 2001. Brook, Chris, Daisuke Kawata, Brad Gibson and Ken Freeman. “The Emergence of the Thick Disk in a Cold Dark Matter Universe.” The Astrophysical Journal, 612:894-899, September 10, 2004. Flynn, Chris, Andrew Gould and John Bahcall. “Hubble Deep Field Constraint on Baryonic Dark Matter.” The Astrophysical Journal, 466:L55-L58, August 1, 1996. Gibson, Brad and Chris Flynn. “White Dwarfs and Dark Matter.” Science Magazine, Volume 292, June 22, 2001. Gondolo, Paolo. “Non-Baryonic Dark Matter.” ApJ, in press, astro-ph/0403064v1. Herrera, Ramon, Diego Pavon, and Winfried Zimdahl. “Exact Solutions for the Interacting Tachyonic-Dark Matter System.” ApJ, in press, astro-ph/0404086v1. Kaplinghat, Manoj and Michael Turner. “How Cold Dark Matter Theory Explains Milgrom’s Law.” The Astrophysical Journal, 569:L19-L22, April 22, 2002. Ma, Chung-Pei and Edmund Bertschinger. “A Cosmological Kinetic Theory for the Evolution of Cold Dark Matter Halos with Substructure: Quasi-Linear Theory.” The Astrophysical Journal, 612:28-49, September 1, 2004. Metcalf, Benton. “The Detection of Pure Dark Matter Objects with Bent Multiply Imaged Radio Jets.” The Astrophysical Journal, 580:696-704, December 1, 2002. Milgrom, Mordehai. “Do Modified Newtonian Dynamics Follow from the Cold Dark Matter Paradigm?” The Astrophysical Journal, 571:L81-L83, June 1, 2002. Reid, Neill, Kailash Sahu and Suzanne Hawley. “High-Velocity White Dwarfs: Thick Disk, not Dark Matter.” The Astrophysical Journal, 559:942-947, October 1, 2001. Root, R. “Exploring the Mirror Matter Interpretation of the DAMA experiment: Has the Dark Matter Problem Been Solved?” ApJ, in press, astro-ph/0403043. Yoshida, Naoki, Aaron Sokasian, Lars Hernquist and Volker Springel. “Early Structure Formation and Reionization in a Warm Dark Matter Cosmology.” The Astrophysical Journal, 591:L1-L4, July 1, 2003. Yoshida, Naoki, Volker Springel, Simon White and Giuseppe Tormen. “Weakly Self-Interacting Dark Matter and the Structure of Dark Halos.” The Astrophysical Journal, 544:L87-L90, December 1, 2000. Baryons are sub-atomic particles – protons, neutrons and electrons. Their counterpart is the non-baryonic particles like neutrinos. VLBI – Very Long Baseline Interferometry. This technique uses an array of radio telescopes to create a virtual larger dish to improve resolution.